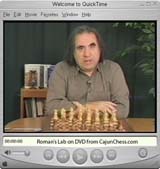 In Volume #31, Roman will teach you how to master the endgame. This DVD expands on the Black opening repertoire recommended by GM Dzindzichashvili - indeed the Accelerated Dragon not only takes its own place within that repertoire but may also be reached when White declines the Dzindzi Indian Defense by playing an early e2-e4. More analysis and recommendations for Black by GM Dzindzichashvili in the Accelerated Dragon concentrating on Black's options after White establishes the Maroczy Bind with c2-c4.